After the guided mystery tour via Satnav to the centre of Burgos with its tall, elegant buildings - in a rush hour - and then having a helpful Spanish Senor directing us to our excellent Sercotel Cuidad Burgos hotel in Rubena, after an excellent dinner and a huge G&T, we were all set for the next leg of our journey through central Spain. Making a note to 'come again' for the excellent Wi-Fi reception and facilities - not least the said G&T - we loaded up and headed south-west towards Valladolid before turning south to Salamanca. Don't the very names instantly conjure up an image of a romantic, ancient Spain in days gone by with dark-eyed Senors riding their stallions while dark-haired beautiful Senoras and Senoritas toiled in the home and on the land as they waited for their men to come home? It was still a dull and windy morning but today was, hopefully, a shorter day before we reached our destination. The land was flatter - or so it appeared - but in reality, we were on the plateau of Central Spain. The view, from our position, almost touching the clouds, stretched for miles. We found a small fuel station with a café. It was most unlike the large ones nearer the more inhabited parts we had just come through but clean and cheap. A coffee doble con leche (double coffee with milk) and a cold drink was an astounding three euros. 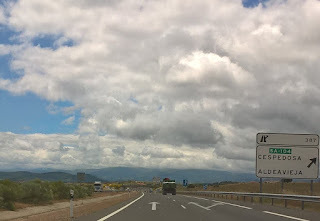 Heading towards Salamanca, the terrain changed as we came down from the plateau. Gentler mountains came into view. Verdant mountains covered in trees and many kinds of vegetation. 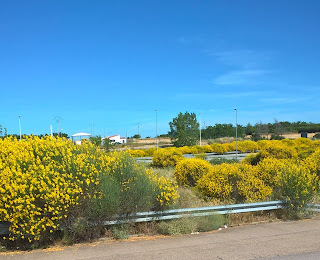 The roadsides were awash with masses of yellow broom. Further on, this gave way to the centre reservations stretching for miles with brightly coloured red, pink, or white shrubs. Amidst the sweeping pastures, a lone church rose high into the sky. Its tall spire almost reaching the clouds as it surveyed and laid claim to the scattered inhabitants surrounding it. Eventually, at Plasencia, we turned west towards Portugal. In my planning, I had marked out that we would go south-west for a bit longer and head towards Cuidad Rodrigo before dropping south. However, our helpful lady with her disembodied voice politely commanded us to head towards Plasencia. It is interesting how, in Spain, the address of a place list the road (Carretera) and the numbers of kilometres along it depending from where it started. This number is used for the junction. See example. My husband asked that we paid attention to the 'lady' as she seemed to know what she was doing. I had to agree as, this later model we had just traded in the old one for most certainly did know what she was dong but I bartered for the return journey to be via Cuidad Rodrigo. Harmony was restored. We were now the very heart of a country area and needed some refreshments. Lunch called but a snack would do. Taking a chance we followed a sign which would take us off the newly made road and turned off to what seemed to be the old road. Here there was a modern filling station - for the car - and a modern café for filling us. It did appear that the café had been extended to include a restaurant, no doubt for all the extra traffic with the road improvements, of which there are many. We found a wonderful light snack of a slice of tortilla de patatas (Spanish omelette with potatoes) each with drinks at the Meson Iberico Casa Marco on the National 630 KM371 in Fresno Alhandiga . A glass of vino tinto, small Coca Cola and 2xPinco (our snack) came to the grand total of four euros forty cents including tax. Can't complain at that! Refreshed we headed towards the Portuguese border and our destination. The road leads you around two sides of a triangle which surround a huge reservoir - the Emblase de Alcantara - fed by the many rivers which flow down the surrounding mountains. 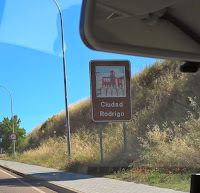 Fortunately, the road had been extended at Coria to by-pass the village of Moraleja and link the two sides of the triangle, which lightened the journey. 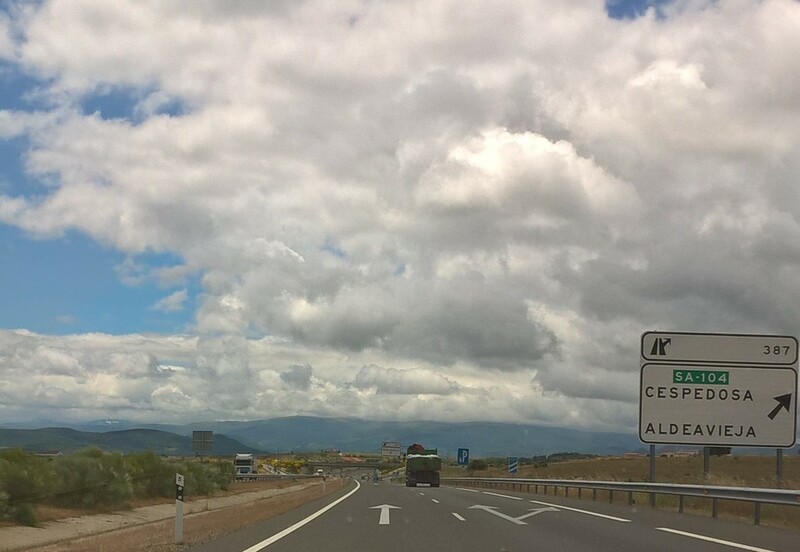 Crossing the border is seamless with excellent signs and no change in road conditions. As this was an A-B journey on motorways we were aware that we would be paying tolls. During our recent visit, we had used a hire car and Europcar advised that if we were heading near Castelo Branco there would be not only unmanned tolls but automatic tolls where cameras at the side of the road simply pinged as it captured your number plate and billed on your card later. 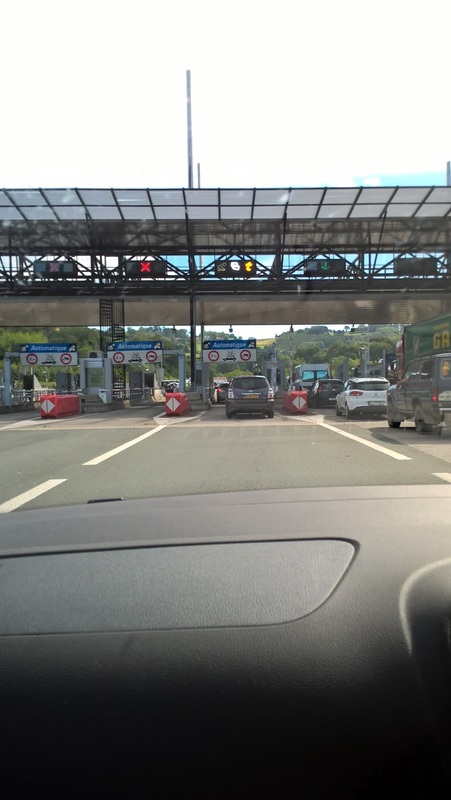 We had taken advantage of the transponder fitted in the car so that we didn't have to worry about this and could simply sail through the other toll barriers as well. 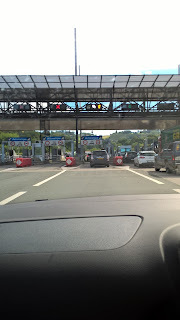 Now, for this journey,we had invested in a transponder for both France and Spain (we weren't using motorways in Portugal) from Toll tickets in Germany. It was the best thing we have ever done. In France, the lane with a letter t - the Tele peage - was for normally for those with a French bank account. We had often seen waggons using these lanes but now this facility had been opened up to those outside France. I mention this as it may help some of you who were not aware of this change. In fact, the number of toll lanes sporting the letter 't' had increased with some having a 30km sign where you didn't actually come to a stop before the camera flashed and the barrier lifted; it was not for a card or cash payment and were not manned. 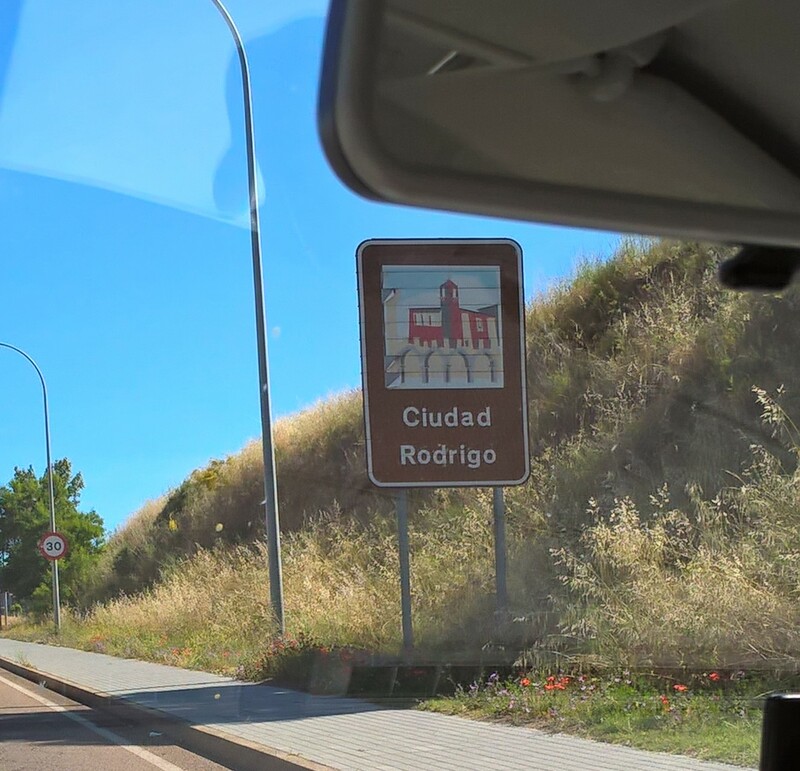 In Spain, the sign was like a t-shirt. Each transponder fitted behind the rear view mirror. On our return home, we simply posted them back and we are charged for the time used regardless of what we had stated on the order form. Hope this helps! It was so easy with no fumbling for buttons when the lanes were unmanned. Next time, I will chat about a most beautiful place where they have thermal springs. Montforthino ad Termes de Montforthino near the Portuguese/Spanish border and a most delightful, traditional hotel with all mod cons. 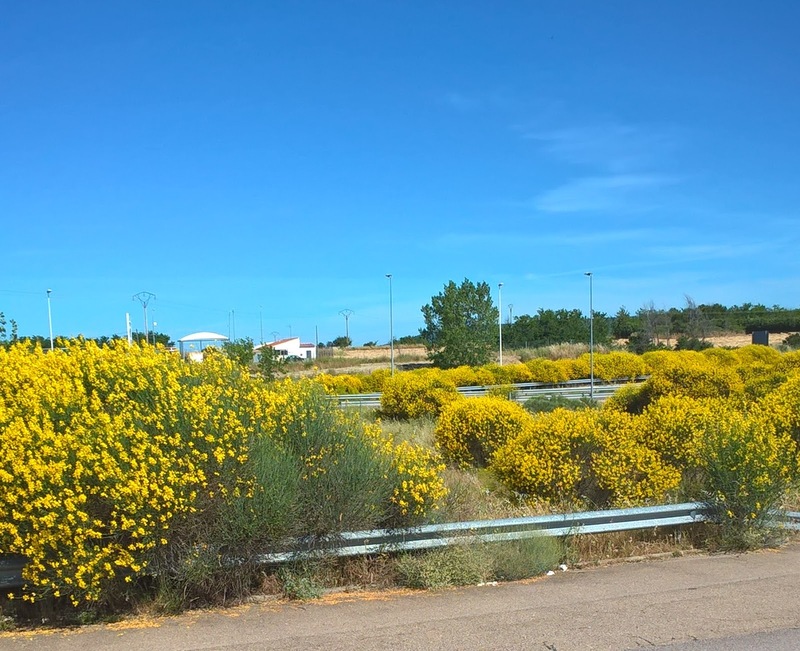 This post is one of three, about our car drive from the UK to Central Portugal with seven hotels in ten days, posted in Rosalie's Chatter Blog.